Life always gets away from me in the summer when time away (lovely as it is) means twice as much work to fit into the weeks afterwards – and it’s not long before we set off again, this time heading down to Cornwall. In between, a little space to draw breath and share what I’m up to. 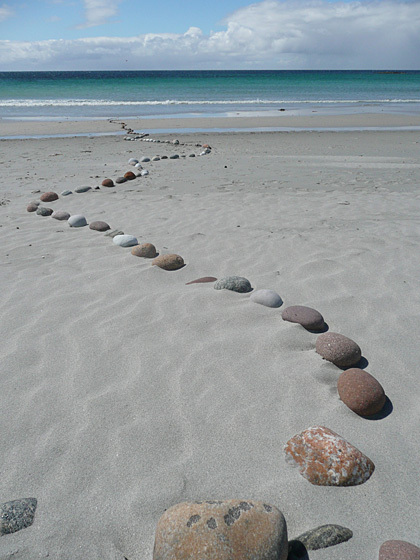 Our visit to Tiree was momentous, to say the least. Alan’s on sabbatical next year and we’ve decided to seize the day and do something we’ve been thinking about for years – to live and work in a small community on a remote and windswept island. So we went there looking for a home – and found one! We’re now jubilant and terrified in about equal measure. The move won’t be till November but there’s going to be plenty to do before then. We have two daughters starting uni this autumn too, one moving from Cornwall to Liverpool, and one just moving round the corner in Birmingham, but both will need help with their stuff. 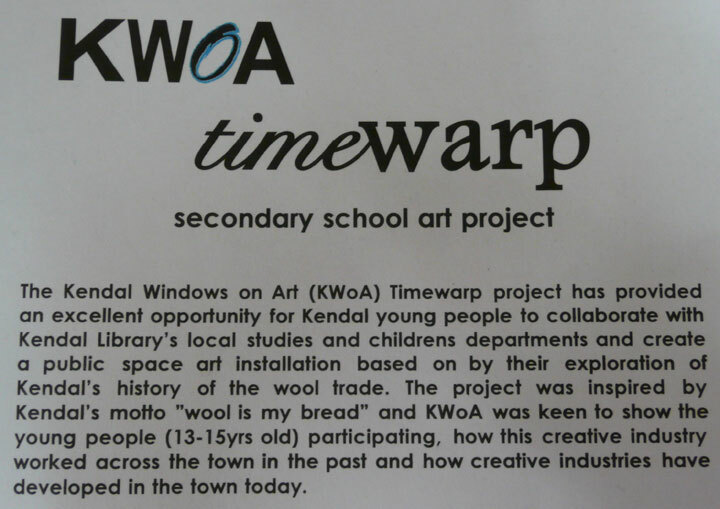 I’ll need to work hard to keep time for art among all this excitement! 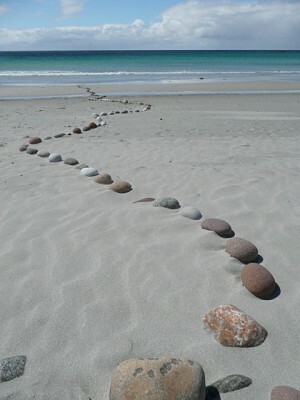 While we were on Tiree I at last joined in with the World Beach Project. And I did a bit more sampling of gathered fabrics while I was away. 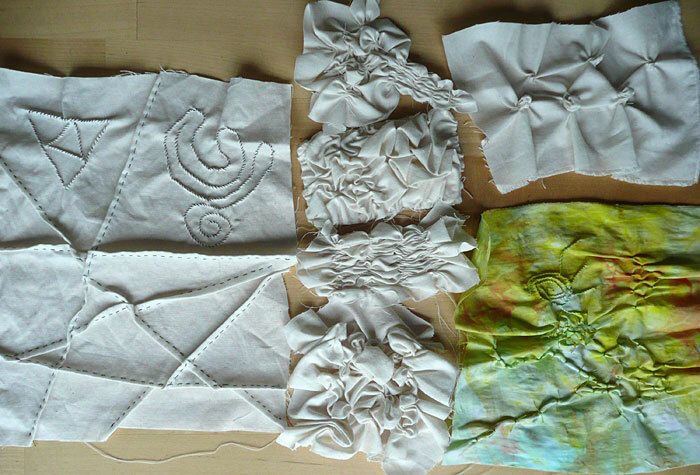 The ones in the middle will end up being dyed, I think. Tomorrow I’m going to a short workshop with the intriguing title “Kendal Green meets Shibori Dyeing”. 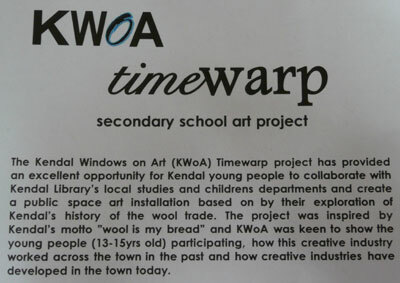 I think I’ve mentioned before that Kendal’s town motto is Pannus mihi Panis – “Cloth is my Bread”; and the arts centre is having a festival to celebrate the town’s heritage with lots of textile events. 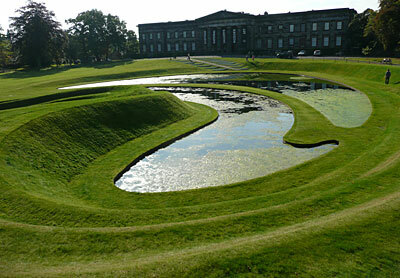 Kendal Green is an old dye colour mentioned in Shakespeare, but I think we’re going to use a modern version! It should be fun, anyway. I’m just wondering if I can take my gathered samples along and throw them in too! 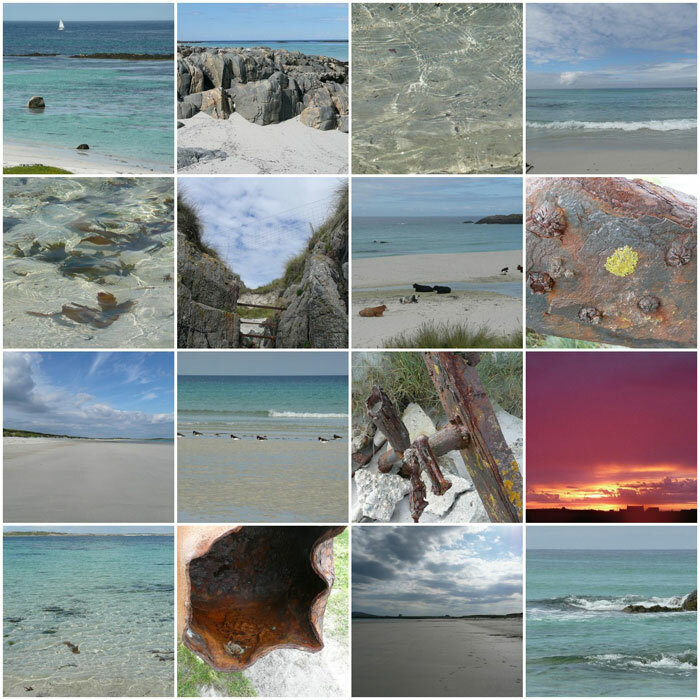 And these are some pics of Tiree I’ve put on Flickr, colours of sea and sky, rust and sand, light and water. I only live about 60 miles from the Scottish border but I don’t often cross it. Last week, however, I went twice! 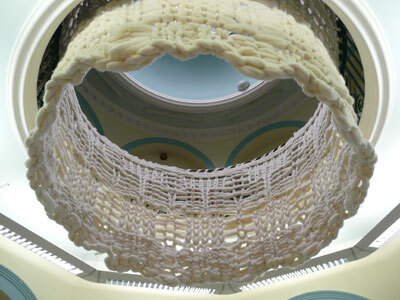 Tuesday was a visit to the Gracefield Arts Centre in Dumfries to review Ruth Lee‘s exhibition, Reading Between the Lines, for the next issue of Workshop on the Web. It’s an excellent show of Ruth’s work and well worth seeing, if you are anywhere nearby before 3 November. There was also a preview copy of Ruth’s new book Contemporary Knitting for Textile Artists, which has gone on my wish list! I’ll post a link to the exhibition review when it’s published in December. 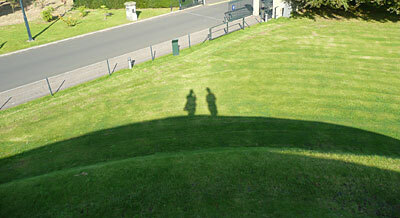 Then on Saturday I caught the train up to Edinburgh to visit my friend Lee and her husband Andy. Lee is a fibre artist who creates wonderfully vivid images in felt, like this "Sheep Number 12". Lee took me on an eclectic tour of the city. First to the Elephant House – not the zoo, but the coffee house where JK Rowling wrote the Harry Potter books. 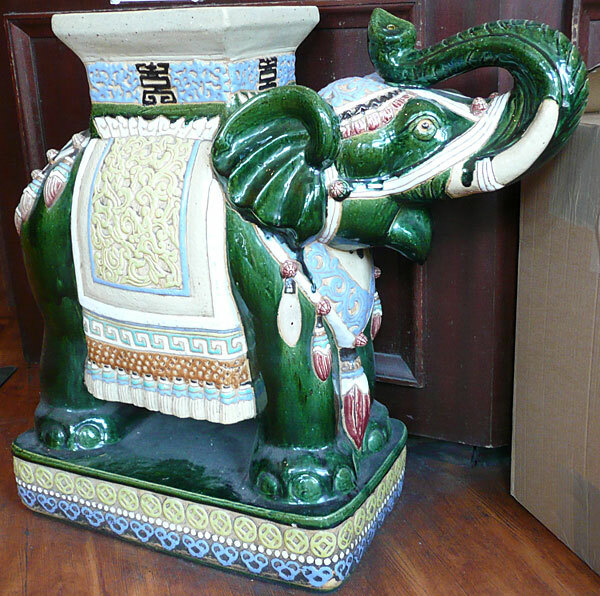 I have a passion for elephants so I was overwhelmed by the sight of so many in one place – models, photos, books, hangings, furniture… this one was given to the Elephant House by “Linda Greer, on behalf of her brothers and sisters, in memory of her father Jimmy Ferguson”. After delicious coffee and cake we took a circuitous route through the city, via the delightful Dean Village and along the Water of Leith to the Museum of Modern Art. In front of the museum is the stunning ‘Landform‘ by Charles Jencks – a landscape of banks and curved pools that you can walk on and around. We ended up sitting in Lee and Andy’s pretty garden, drinking more coffee and enjoying the late afternoon sunshine. A beautiful day in a beautiful city. Tuesday sounded as if it was going to be the last fine day for a while, so Alan suggested we went into the Lakes for a few hours. We drove up towards Keswick and over Honister Pass, then on to Whinlatter (a favourite haunt when our girls were children). I had fun taking pictures from the van window on the way, one or two turned out to be quite interesting combinations of blur and focus. 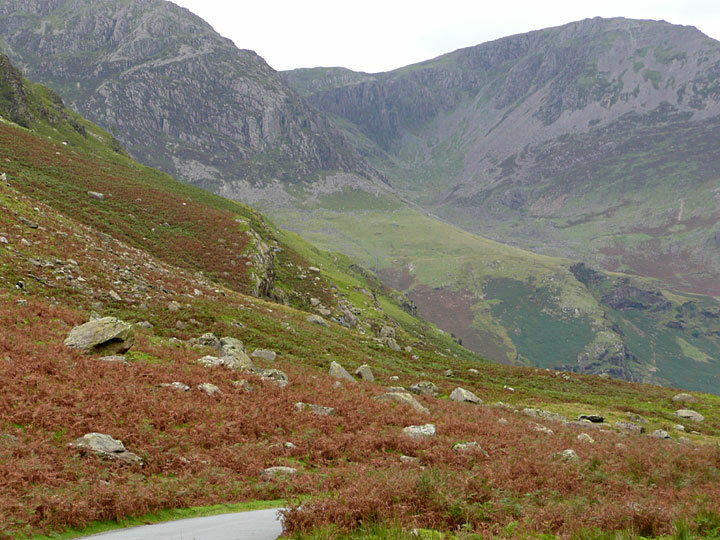 The range of autumn colours in the mountains is incredible. 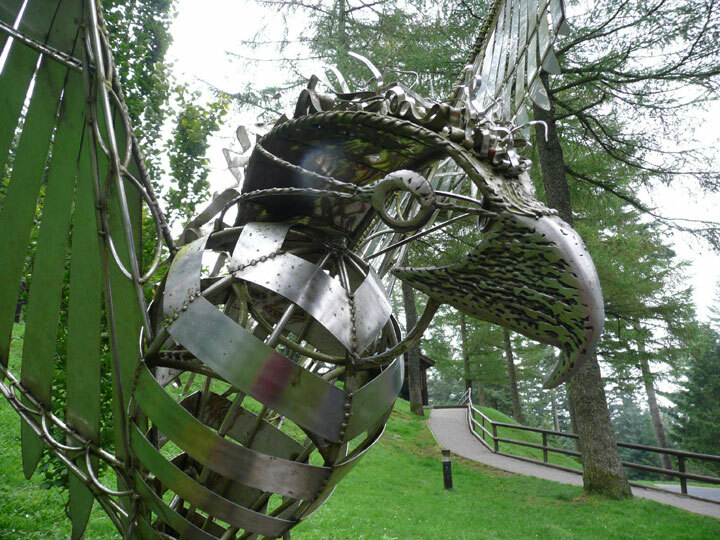 This is the spectacular metal sculpture of an osprey outside the Visitor Centre at Whinlatter. (Real ospreys nest in the area). 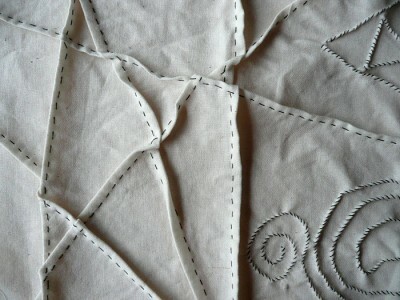 I’ve uploaded some more images to Flickr. 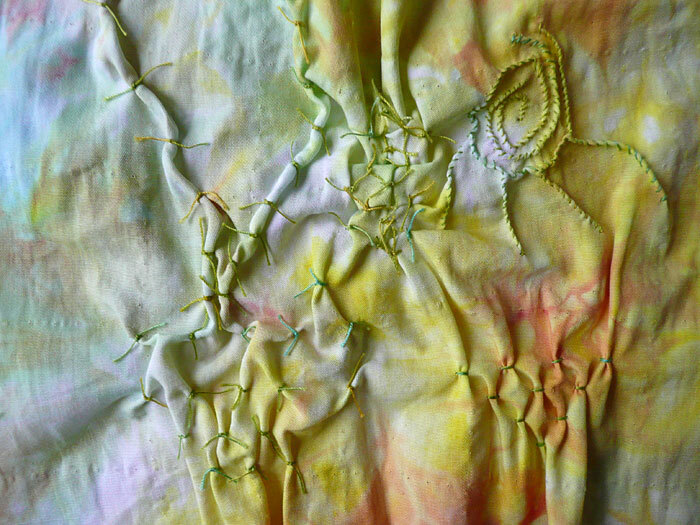 I have been working on colour mixing exercises with stitch for OCA Textiles 1, using dotty stitching – French knots in a pointillist style. This calls for good primary and secondary colours, and I soon discovered that I actually have very few of those in my stash – mostly variegated threads and random bits and bobs. 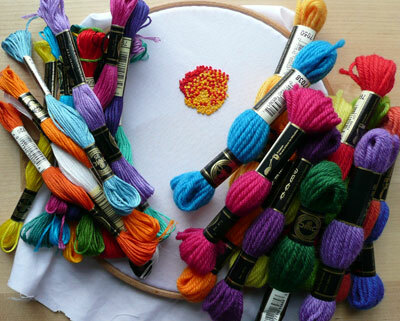 I started a very small sample in some red and yellow threads I dyed a while back, and ran out of those, so today I went down to town and bought a small rainbow – well, two rainbows, one in stranded cotton and one in wool. That should keep me going for a while! 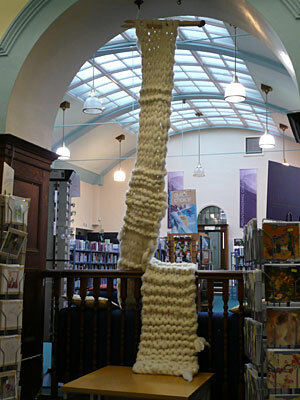 I was in the library too and saw this dramatic, enormous knitting installation in the foyer. They said I could take some pics to share with you. 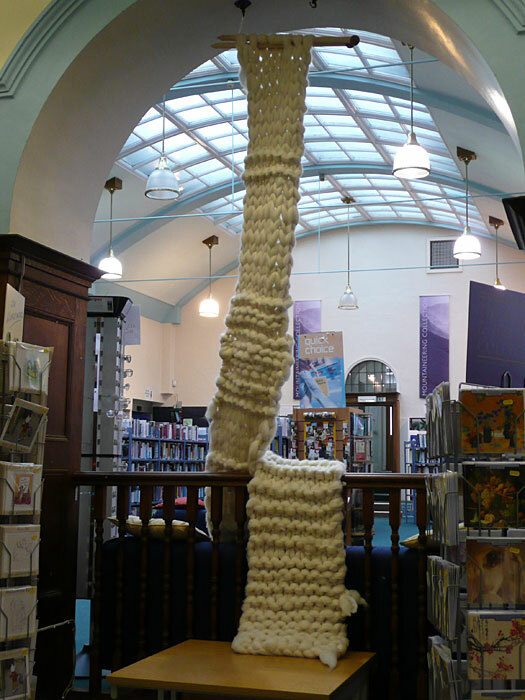 Kendal is a town whose history is intimately connected with wool production – its motto is ‘pannus mihi panis’ – ‘cloth is my bread’, or as people often interpret it ‘wool is my bread’. 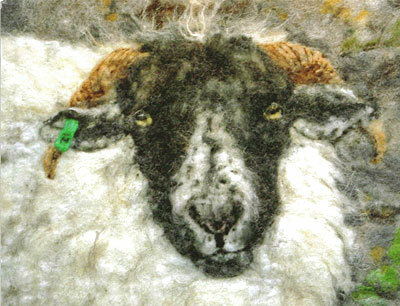 We even have our own breed of sheep – the Rough Fell. This project celebrates that heritage. I haven’t been working or creating much this week – the weather has been lovely and we’ve had two days out to the coast, yesterday to the north west Cumbrian coast and on Thursday to the Galloway coast on the other side of the Solway. 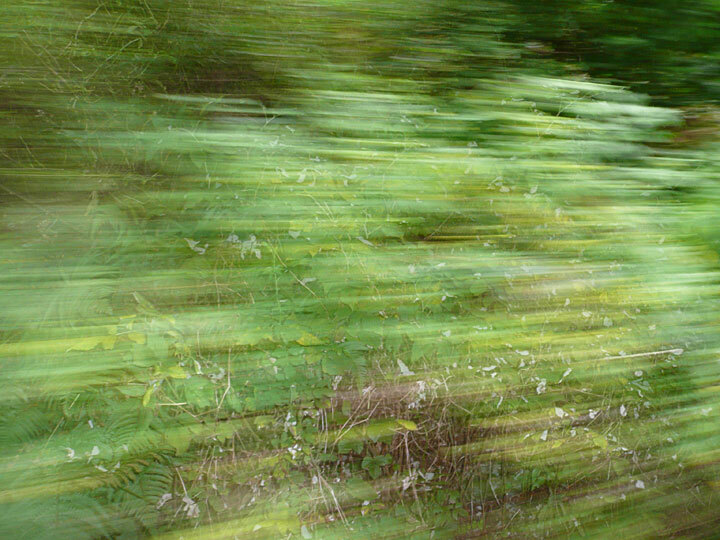 I’ve uploaded some photos we took yesterday to Flickr. The combination of nature and industry there makes for a beautiful landscape full of rusty colours, greys and bluey greens. 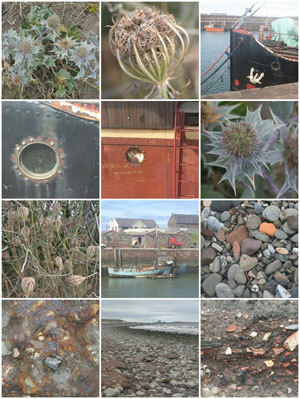 We visited Maryport and Allonby and walked by the sea. Allonby has a long sandy beach and as you approach you see the colourful arcs of the kitesurfers all along the shore line, like huge birds hanging in the air. 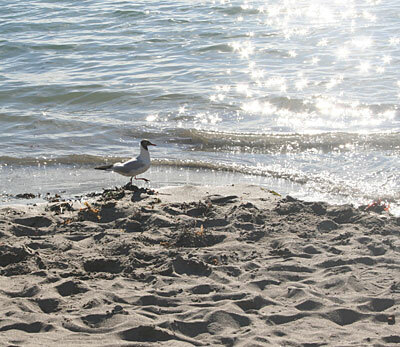 There are many graceful old houses, and close-cropped turf greens by the sea where people play. There were two stripy pigs wandering about on the grass too (I think they were these). 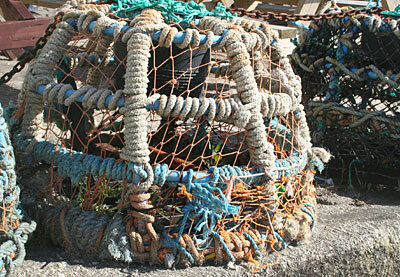 I used to go to Allonby as a child but hadn’t been back for many years – I had forgotten what a delightful place it is. 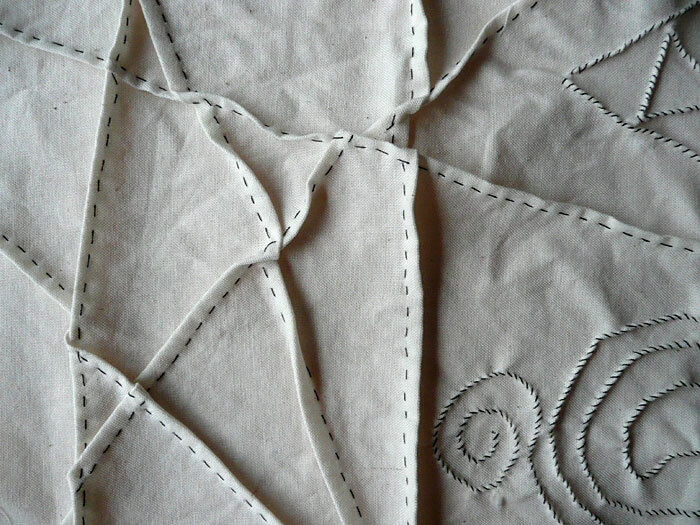 Most people who read this have probably heard by now, but just in case – Sharon B’s blog In A Minute Ago is now at a new home, so blogrolls and bookmarks need to be updated. Some time seems to have gone by since I last posted. We had a weekend away in Cornwall, and visited the Eden Project for the first time. 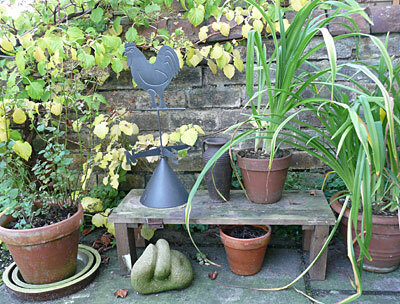 They currently have a very interesting exhibition of recycled products from all over the world – kNOwtrash. I can’t find it on their web site, but it includes textiles, furniture, accessories and jewellery, and is on till 12 September. I came away with some ideas for my craft session at youth club – braiding with newspaper, jewellery with bottle tops, and flowers from plastic bottles. 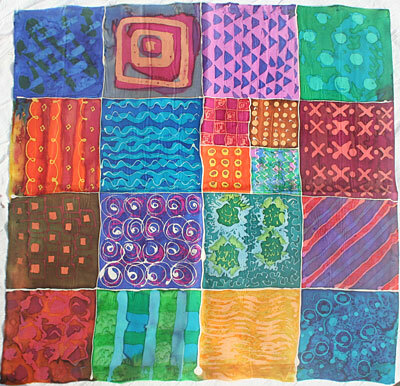 Many of the items were from groups and collectives overseas, plus some by individual artists including Michelle Brand’s beautiful and eyecatching work using plastic bottles and shop tags. I hope the Eden Project will archive some images from the exhibition on their web site – it was very inspiring. My daughter Esther is borrowing a few of my samples for an exhibition at her church, so I’ve photographed them before sending them off. 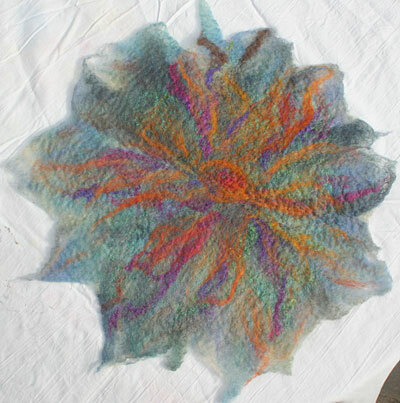 These were from a batik workshop with Nell Dale and a feltmaking workshop with Jenny Scott. 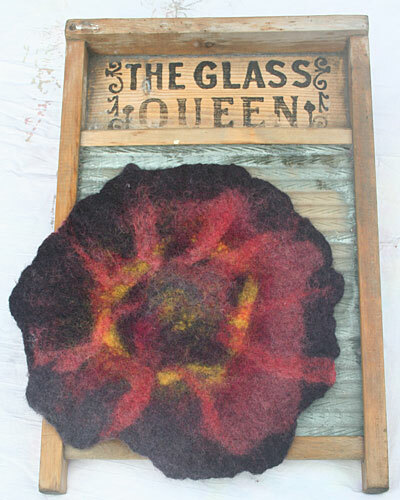 The Glass Queen is a lovely old washboard I found on eBay, she’s perfect for fulling felt. 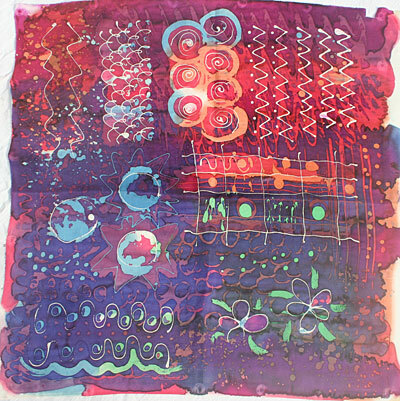 I had an exciting delivery this week – I’d ordered Tray Dyeing by Leslie Morgan and Claire Benn (Committed to Cloth) from the Embroiderers’ Guild bookshop. Wowowowow!!! It’s only a short book but packs in a huge amount of information and although I’ve done some tray dyeing before I was astonished at the amount of control that can be achieved and can’t wait to try. I’ve been working really hard this week to try and clear a couple of days to do art as I haven’t been doing much at all with being away and having visitors. I was having fun experimenting with colour mixing on paper, but I’ve lost my impetus and I need to get back to it and back into it. Only a couple of photos in Cornwall – I’m hoping to get a new small camera soon. This jaunty little seabird by the starry water, at Polkerris, near St Austell, and a random lobsterpot decorating the wall of the inn there.